WELCOME TO EMILY’S GRAIN FREE! Emily’s Grain Free! produces delicious, organic “Grain-Free-Ola”. You can purchase Emily’s “Grain-Free-Ola” at these western Massachusetts stores. 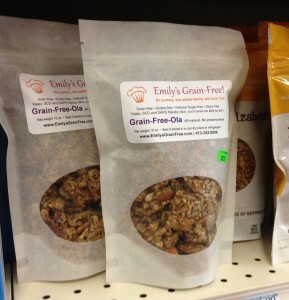 For the latest news about Emily’s Grain-Free!, check out our Facebook page. Don’t forget to like us when you’re there! We are so happy you are enjoying Emily’s Grain-Free! In college, I was diagnosed with Crohn’s Dis-ease. My doctor tried various medications to control the symptoms which caused unpleasant side effects with the potential for additional permanent effects in the future. These concerned me very much so I searched for an alternative approach or remedy to heal my symptoms. I sought the help of a naturopath, who was confident he could get me “off Prednisone”. He succeeded and my symptoms were significantly lessened, though still intermittent. In 2009, I developed fistulas. The radiologist and my gastroenterologist agreed I had 2 options: 1. imminent surgery and the removal of part of my intestines; or 2. medication with potentially bad side effects! When I requested a second opinion, my doctor recommended a gastroenterologist in Boston. During the consultation, I was given the same 2 previous choices, but under his breath, he told me of a third option: a diet that had resulted in positive results for some people with digestive issues. I was ecstatic at the possibility of an alternative, non-allopathic option. I chose the third option, the Specific Carbohydrate Diet (SCD), and made lifestyle changes, all of which my own doctor agreed I could try. After several months on the diet, subsequent colonoscopies showed proof that the fistulas and the Crohn’s had healed without surgery or medication! It has now been nearly 6 years on the SCD and I remain healed! As a cantor, I am drawn to the Jewish concept of “guarding the body” and the connection between the mind, body and soul. My own healing journey is an embodied testament to the belief that the mind, body, spirit and soul are inextricably connected.